Cacao bean is got from the cacao tree. It was first grown in South and Central America around 1500 BC. 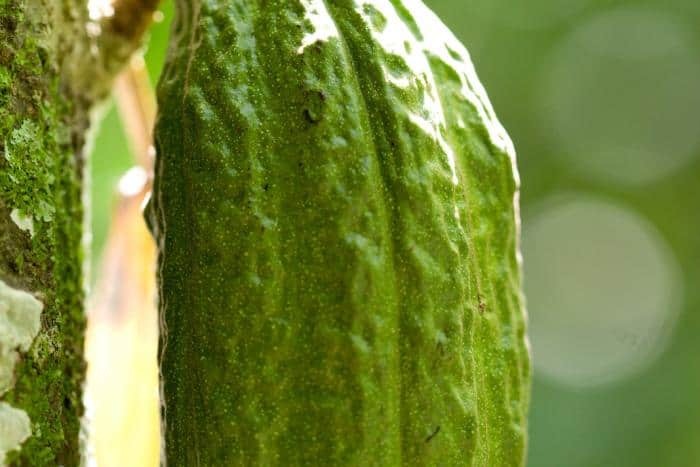 Ancient Aztec and Mayan civilizations used the entire fruit of the cacao tree for medicinal purposes. Slowly, Spanish conquerors introduced the cacao bean to Europe. It is now farmed in many areas around the Amazon and Orinoco River Basins, several parts of Africa, Caribbean Islands and Indonesia. There are three types of cacao beans – Criollo, Forastero and Trinitario which provide the entire world’s supply of chocolate. The ripe cacao pods contain cocoa beans from which cacao butter is extracted. The cacao nibs found in the center of each bean is used to produce chocolate after a process of fermenting and heating. Raw cacao contains flavonoids, caffeine, theobromine, tryptophan, oleic acid, magnesium, anandamide, phenylethylamine , proteins, fiber, carbohydrates, manganese, iron, copper, zinc, calcium, vitamin B1, B2, B5, B3, B9 and E.
Organic and non-organic cacao beans contain similar nutrients. The difference is in the farming practices. Organic farming is meant to protect the ecosystem by promoting sustainable farming methods. It is said to be a socially responsible way of farming by which animal welfare is protected, soil and water conservation and soil regeneration is practiced. Food products are grown without using synthetic herbicides, pesticides, genetically modified organisms (GMO) or fertilizers. Processed organic foods – e.g. organic cocoa powder – will not contain synthetic additives, chemical preservatives, waxes or colorings. Purchasing organic cacao can offer various benefits. The first will be the benefits of consuming an organic food product. This includes food that is free from genetic modification and grown in healthy, fertilizer free soil. Innovative research is adopted by many organic farmers, such as energy efficient farming. Consumers get greater choice of purchasing organic or non-organic cacao. Many chefs in top restaurants believe that organic foods do taste better and cook with only these products. Many consumers also believe that organic food tastes better. The other benefits are of course the nutritional benefits we get from organic cacao, which is more or less similar to non-organic cacao except that it will be free from all forms of chemicals. Raw cacao has a low calorie and fat content that helps to maintain blood sugar levels. The antioxidants in cacao can protect the body from free radicals and prevent the growth of diseases cells. Raw cacao is said to contain more antioxidants than red wine and green tea. It contains naturally occurring stimulants like phenylethylamine which is an anti-depressant and can reduce mood swings and it also contains theobromine a mild stimulant that gives us energy and other benefits. Raw cacao contains no sugars and good levels of carbohydrates. Organic cacao offers benefits to the heart, lungs, liver, kidneys and bladder. It can help diabetes, prevent wrinkles and other skin conditions and help in the treatment of asthma, bronchitis, intestinal diseases and more. While organic farm practices are encouraged with the idea of conserving soil and water and adopting renewable energy practices, there are lots of problems that are encountered with organic cacao beans. Most of the world’s supply of cacao comes from Nigeria, Ghana, Brazil, Ivory Coast, Cameroon and Indonesia. While it is possible that these countries do follow organic farming practices, many of them use child labor and some laborers could be victims of human trafficking who are ill-treated by the cocoa farmers. To avoid this, we must ensure we buy cocoa from those who practice fair trade practices where the basic wage is paid to laborers. Organically produced cacao beans face a greater threat of pests since pesticides cannot be used to kill them. This results in greater crop loss and lower yields. The problem can be partially solved by using botanical pesticides – e.g. neem oil. Organic foods are always more expensive than non-organic ones. The cost of organic cacao is 10-40% more than non-organic cacao. Buying in bulk can help reduce the cost. Organic products are generally hard to find and most general stores do not carry them. Organic cacao maybe purchased from special health food stores or ordered online. Organic cacao usually does not produce many side effects. Those who are sensitive to ingredients in cacao like polyphenols must avoid cacao. Theobromine found in organic cacao could be harmful to some animals like dogs or cats. Excess consumption could result in other side effects like sleeplessness, nervousness or fast heartbeat. If you are particular about buying organic food, check the labels for the right certification. The USDA for example has 3 types of organic labeling. Organic food is said to be tastier and some people even state that the right growing practices can increase the nutritional value of organic foods. Our articles are written by writers with a deep domain understanding of the topic and usually hold Bachelors / Masters degrees. The articles are peer-reviewed before being uploaded on the website. Our writers spend 10s of hours researching and writing articles which are factual and comprehensive. Check out about our team in About Us section. The information on this website is not intended to replace a one-on-one relationship with a qualified health care professional and is not intended as medical advice. The material appearing on the website is for educational use only.